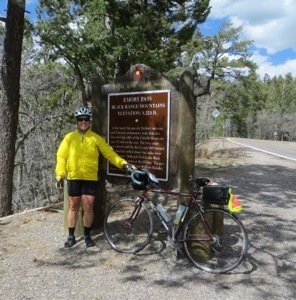 Forget the mundane details of the ride: in summary I climbed over 5,200 feet in 48 miles to Emory Pass, elevation 8,228 feet, the highest point on my cross country ride! 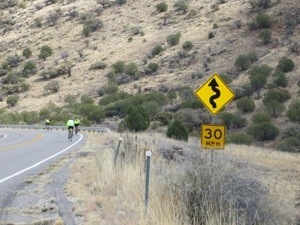 I took the 16+ miles of uphill in two mile increments, using the road markings to give me a goal to keep going. 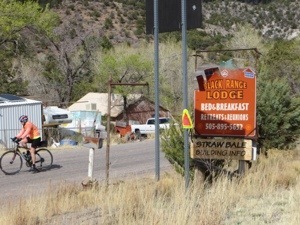 Starting this morning, we encountered rolling hills leaving Silver City. 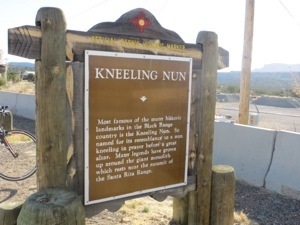 At our first sag stop, we had a great view of the rock formation called the Kneeling Nun. 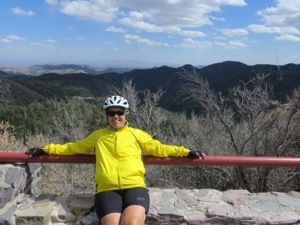 Next we stopped at the Chino Mine observation area. 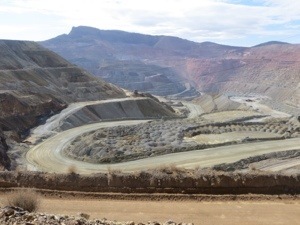 This is one of the largest copper mines in the world, owned by Freeport McMoRan (the Tyrone mine we saw on Wednesday was also a copper mine, not a silver mine). 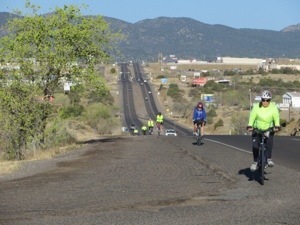 At mile 24, the climbing began, moving from cactus and brush to pine forest and rock outcroppings. 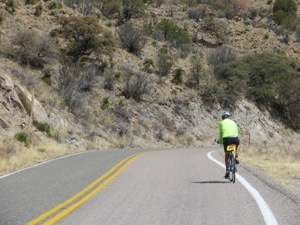 As hard as the day was, the scenery was breathtaking, and we were blessed with very little traffic. 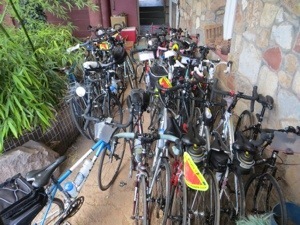 Tonight we are staying in Kingston, population about 20. 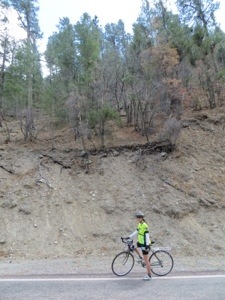 Total miles 48, average 8.2 mph. Enjoying your blog. 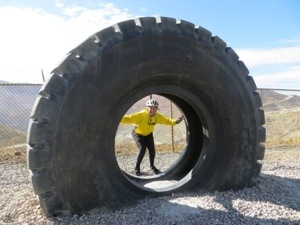 And feeling quite out of shape! 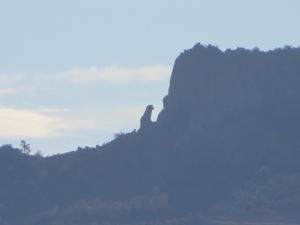 Impressed with the Kneeling Nun rock formation. 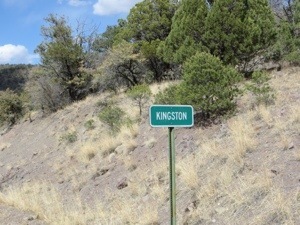 What exactly is there in Kingston, population 20, other than a hot tub? 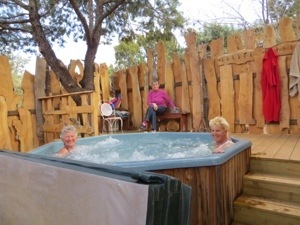 Delightful lodge with lots of reading material, pool table, etc. After a day like today, don’t need much diversion, just sleep. I’m short of breath just thinking about all that climbing, good job! WOW! You’re an inspiration to those of us (me) new to the sport. Hoping some day to be able to make a trip such as this, but I have a way to go before that day. So glad you’re sharing your adventure with all of us! What’s that saying you told me once (or twice)? . . . . . keep the rubber side down . . . . . .or something like that. 🙂 Stay safe.